Ecoffee Cup is a new generation of reusable takeaway cup. Created with the world’s fastest growing, most sustainable crop – bamboo fibre (as well as corn starch and strengthening binder), Ecoffee Cup is BPA and phthalate free. If you haven’t experienced Ecoffee Cup, it feels a bit like thick, yet super-light cardboard; hard to believe it can hold hot liquids. 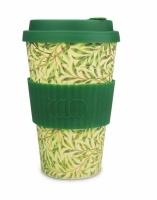 By using a reusable cup you are saving landfill waste and can even save money when buying your coffee from many of the well known coffee shops.